This name uses Spanish naming customs: the first or paternal family name is Campaneris and the second or maternal family name is Blanco. Dagoberto Campaneris Blanco (born March 9, 1942), nicknamed 'Bert' or 'Campy', is a Cuban American former professional baseball player. He played in Major League Baseball as a shortstop for four American League teams, primarily the Kansas City and Oakland Athletics. One of the mainstays of the Athletics' championship teams of 1972 to 1974, he holds the A's franchise records for career games played (1795), hits (1882) and at bats (7180). He led the AL in stolen bases six times from 1965 to 1972 and retired with the seventh most steals in history (649). He led the league in putouts three times, and ended his career among the major league leaders in games (5th, 2097) and double plays (7th, 1186) at his position. A small, skinny player at 5 ft 10 in (1.78 m) and 160 pounds (73 kg), the Cuban-born Campaneris was a key figure on the A's of the 1960s and 1970s. In his debut with Kansas City on July 23, 1964, Campaneris hit two home runs, the first coming on the first pitch thrown to him by Jim Kaat. He is one of five players in major league history to hit two home runs in his first game; Bob Nieman (1951), Mark Quinn (1999), J. P. Arencibia (2010), and Yasmani Grandal (2012) are the only others to accomplish this feat. In 1965, Campaneris led Kansas City in batting average (.270), and led the league in triples (12) and stolen bases (51), the latter mark being the highest total by an Athletic since Eddie Collins's 58 in 1914 with what were then the Philadelphia Athletics and breaking Luis Aparicio's nine-year run of the American League stolen base title. In 1966 he finished 10th in the voting for the AL's Most Valuable Player award after having a similar season at the plate, but playing more regularly at shortstop. In his postseason career he had 11 RBI with 3 home runs, 4 doubles and a triple, scored 15 runs, and stole 6 bases in 37 games. In Game 2 of the 1972 American League Championship Series against the Detroit Tigers, Campaneris already had three hits, two steals and two runs when in the 7th inning he faced pitcher Lerrin LaGrow. After a pitch hit him in the ankle, Campaneris threw his bat at LaGrow. The benches cleared, with Detroit manager Billy Martin going after Campaneris; both Campaneris and LaGrow were ejected. Campaneris was fined and suspended for the rest of the ALCS, as well as the first seven games of the next season, but was permitted to play in the World Series win over the Cincinnati Reds. In the 1973 American League Championship Series, in which the A's defeated the Baltimore Orioles, he led off Game 2 with a home run, and won Game 3 with a leadoff home run in the 11th inning; in Game 7 of that year's World Series against the New York Mets, both he and Reggie Jackson hit two-run home runs in the third inning off Jon Matlack—the only two home runs Oakland would hit the entire series. The A's took a 4–0 lead and went on to win the game and repeat as world champions; Campaneris caught Wayne Garrett's pop-up for the final out of the Series. In 1974 he broke Jimmy Dykes' franchise mark for career at bats (6023), and in 1976 he broke Dykes' mark for games played (1702), as well as Al Simmons' Athletics record of 1827 career hits. After the 1976 season, he signed with the Texas Rangers, but he saw his playing time reduced in 1978. In May 1979 he was traded to the California Angels, and he split time at shortstop over the next two seasons with Jim Anderson and Freddie Patek before playing as a reserve third baseman in 1981. After spending 1982 in the Mexican League, Campaneris returned to the majors for a last hurrah in 1983 with Billy Martin's New York Yankees. He batted a career-high .322 in 60 games at second and third base before retiring. On September 8, 1965, as part of a special promotion featuring the popular young player, Campaneris became the first player to play every position in a major league game. On the mound, he pitched ambidextrously, throwing lefty to left-handers, and switched against right-handers. Since then, César Tovar (Twins, 1968), Scott Sheldon (Rangers, 2000) and Shane Halter (Tigers, 2000) have joined this select list of nine-position players in a major league game. On March 12, 2015, actor Will Ferrell played in five Major League Baseball Spring training games at all nine positions to honor Campaneris. 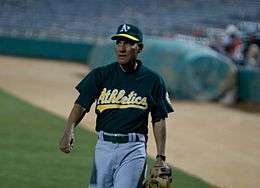 Following his retirement, Campaneris wanted to coach in the Major Leagues, but no one gave him a chance. He then landed a few minor league opportunities, until the Seibu Lions offered him a job to coach defense and base running with them in 1987. And Campaneris added a new highlight to his résumé, as the Lions won the Japan Series in both 1987 and 1988. Afterwards, Campaneris played for the Gold Coast Suns of the Senior Professional Baseball Association in its inaugural season of 1989. As the oldest everyday player in the league at 47, he hit .291 and stole 16 bases in 60 games. Campaneris currently lives in Scottsdale, Arizona, and often participates in Old-Timers' games around the country. He also conducts baseball camps and is an active participant in the Major League Baseball Players Alumni Association, often playing in charity golf tournaments. ↑ need verification - only a nine year old at the time. ↑ The Chronology | This Day in Baseball – September 8 Archived October 19, 2012, at the Wayback Machine. 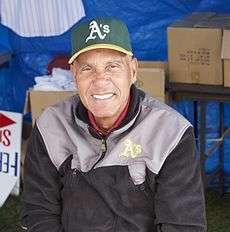 ↑ Oakland A's/Seibu Lions Series: Bert Campaneris. Graveyard Baseball. Retrieved on February 29, 2016.